Low-lathering, sulfate-free shampoo formula that gently cleanses and adds moisture and definition without weight. Leave-in/rinse-out conditioner formula quenches hair with weightless conditioning and can be left in for extra curl definition and softness. Everyone always wants lush (but not too thick), curly (but not course) TV commercial-worthy hair. Well, my daughter has this, but maintaining the gloss, and keeping it healthy and tangle-free, is a daily beauty (and time consuming) challenge. 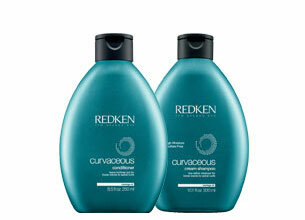 Enter the Redken Curvaceous Cream Shampoo. The non-descript dull blue packaging doesn’t scream TRY ME immediately. Nor does the smell. But wait until you’ve shampoo’ed and conditioned your hair and then pull up a chair. Despite the low foam formulation, there was enough foam for my daughter and I to feel that we’d given the curls a good wash and stripped away the daily grease and grime from hockey practice and lie’ing down with the family dog. Follow this with the Redken Curvaceous Conditioner but be careful to use no more than a R5 coin size portion if you have shoulder length hair, as it tends to leave a dull cakey film on the hair (as if someone had accidentally sprinkled icing sugar on your head). According to the packaging it is a leave-in or rinse out conditioner but the slight menthol smell made us want to rinse the hair immediately. Despite this though, it left her hair super smooth and silky, with far less fly-away pieces than usual. If you’re tired of fighting with your curls and yearn for a wash and go yet frizz-free routine for curly hair, then this is the product for you. Both products really defined her curls beautifully with a fabulous weightless shine. This was not my favourite hair product on the market and I won’t be purchasing it again. Finally a product that works for my wild curls, now I look fab all the time.